You have no idea where to stay in Cape Town? Well, I highly recommend you to book accommodation in Tamboerskloof. 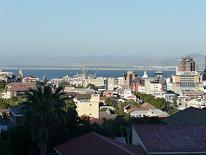 It is one of the greenest quarter in Cape Town. Right at the foot of the gorgeous Lion's Head mountain and in the vecinity of Table Mountain, you have the feeling to be in the middle of Nature while you are acually in the middle of a big city! It will take you 5 minutes to drive to Camps Bay or Clifton and 10 minutes to the V&A Waterfront. Also, it is very quiet in terms of noise and...wind! When the 'South Easter wind' blows, it can be VERY annoying in certain parts of the city (Vredehoek) while in places such as Tamboerskloof, you will feel the wind at a much lower degree. If you have to measure how strong the wind can be in Tamboerskloof, on a scale of 1 to 10, it would be at 5 while in Vredehoek it will be at 9 and even 10! I lived 3 years in Warren street in Tamboerskloof and I was amazed to be that close of Kloof neck which a very busy road and to hear nothing else than the children playing at the school opposite the road! On Sundays, during a few seconds I was in a small village in France...thanks to the church bell 400 meters away! Ouah! In Tamboerskloof, there is even a farm!!! You must remember that it is right in the city and there is a farm with pigs and ducks (in Military road)!!! 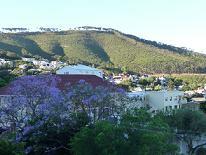 Another great advantage of renting or booking accommodation in Tamboerskloof is the view. Wherever you decide to stay or live in this quarter, there is a great chance that you will have a view on Lions Head or Table Mountain or on the city! The reason is: it is one of the highest quarter in Cape Town and most of its streets go up. Tamboerskloof is the kind of quarter where you feel relaxed because it is close to where everything is happening ( Long street , Kloof Street, the beaches , the Waterfront ...) and at the same time, far enough to relax in a quiet environment when you come 'home'. There are plenty of nice accommodation in Tamboerskloof. I have listed a selection of lovely places from the cheapest to the most expensive one. If you are looking for staying on a long term, I advise you to check my page on renting in Cape Town. This backpacker is ideal to enjoy the trendy part of Cape Town. It is one of the quieter hostels in Cape Town so it is a great cheap and peaceful place to stay! It is also an environment friendly backpacker so it is very clean. This guest house with a stylish interior is an elegant place to stay in Tamboerskloof. I like the fact that there is only 6 rooms which make it intimate. And the cherry on the cake: a cake will be provided in the lounge every day! This guest house is in Warren street so I can assure you that you will have peaceful time! The combination of Cape Dutch architecture and African decoration makes this place very unique. This hotel is very cosy with an English style and focuses on details. They have an in house restaurant which offers gourmet cuisine for dinner. For breakfast or lunch, you must try The Full Monty breakfast from The Daily Deli (13 Bronwlow Road ). 90% of the Daily Deli's customers are local because it is not the type of places listed on guides. The location is away from the touristic places and that what makes the charm of this unique place, right on the pavement! For dinner, there are two great restaurants that you should try: Millers Thumb (10b Kloof Nek Road) where th menu features dishes with a Cape Malay and Cajun influence, and Kyoto Garden which isone of my favourite asian restaurant in Cape Town where you can order giant scallops, fresh wasabi roots, green tea ice cream...Miam!